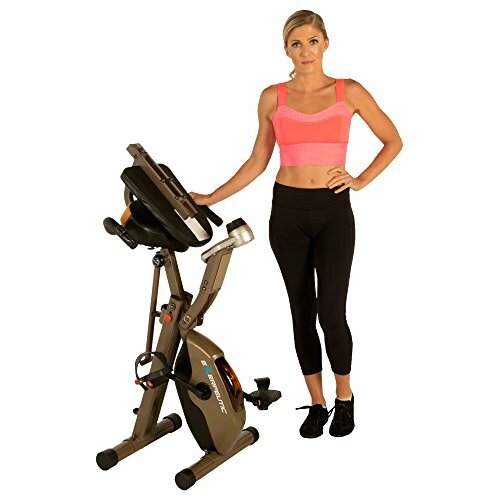 Are you on the hunt for cardio equipment that won’t take up a ton of space in your home? Maybe you’re concerned that smaller machines won’t give you a great workout? 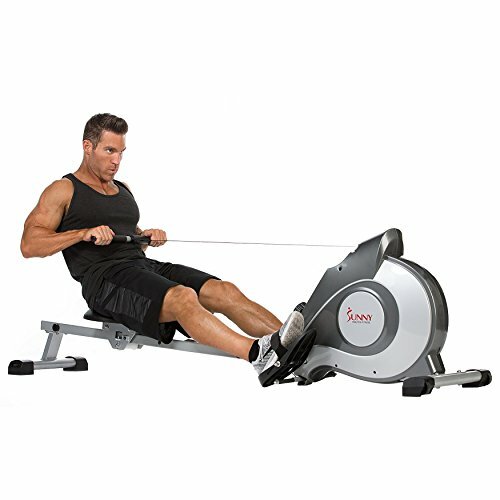 Well, to put your mind at ease, we’ve carried out extensive research and found the best cardio equipment that will give you awesome workouts AND be easy to store away. 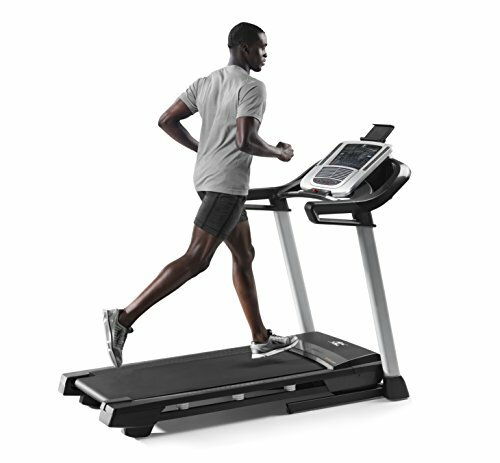 Our top pick is the NordicTrack C700 Treadmill. But what makes it our number one choice? It combines incline settings, fitness-boosting tech, and the ability to fold and store away afterwards. Sound perfect for your space? Learn more about what this treadmill has to offer below! 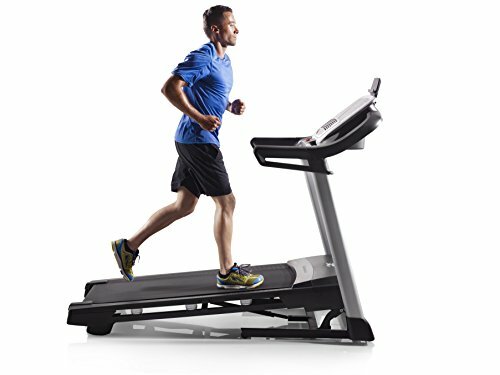 This Nordic Track treadmill uses a 2.75 CHP motor to power the 22”x55” cushioned deck. The tread belt surface is constructed with FlexSelect materials that provide a cushioned surface to reduce the impact on joints. However, if you feel like having a more solid surface, you can alter how soft or hard you want the deck to feel using the simple control settings. If walking or jogging on a flat surface doesn’t cut it for you, there’s a great incline feature built-in. It enables the treadmill to rise by 10% to give you the feeling of going up a hill. This means you can work your body harder and burn more calories compared to a flat level. Customers are loving how they can see all of their stats with a quick glance at the large LED screen. This shows you information on the calories burned, distance travelled, and heart rate. 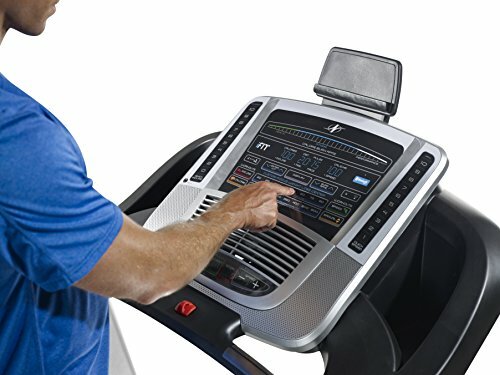 NordicTrack treadmills use iFit tech to customise your workouts. By using the iFit coach, you’re able to set real routes as it’s connected to Google Maps which you can see via the LED display. You can experience an impressive 20 workouts. Each one of them is different and created by professional personal trainers. 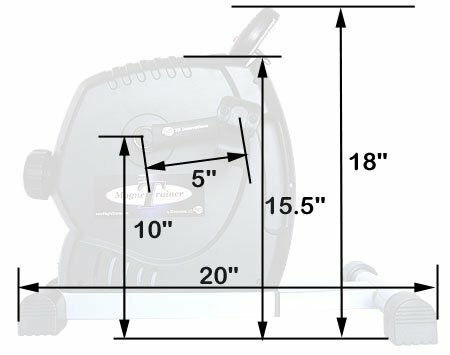 Despite the fact that this treadmill provides you with a 22”x 55” long surface to exercise on, it can still be easily stored away. 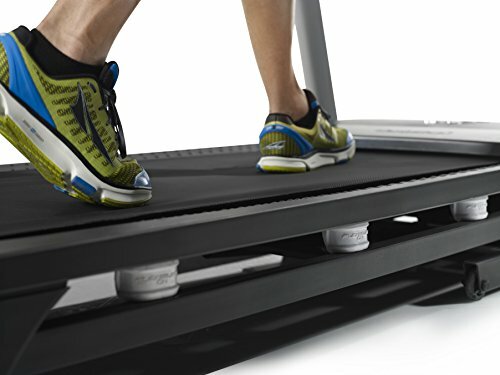 Take advantage of the SpaceSaver feature that lets you effortlessly fold the treadmill up. There’s an EasyLift aspect built-in which takes most of the weight for you. So, once you’re done with your workout, you can simply fold the treadmill and store it away to save on floor space. The NordicTrack C700 Treadmill may not be the best option for serious runners. While it lets you choose from various custom workouts and give you the chance to walk and jog on an incline, sprinting on it could cause issues. It’s built for walkers and joggers and therefore, may not be able to sustain the impact of constant sprinting. The incredible tech features truly do enhance your workout experience. This, combined with the SpaceSaver design, is what makes it the number one pick on this list. While it is a little on the pricey side compared to the other options below, it’s actually modestly priced for a treadmill. It’s fantastic for walkers and joggers, but if you’re seriously into running, you may want to check out some sturdier options. We recommend the Free Motion 850 Treadmill. Through our research, we also found numerous other cardio equipment that would fit perfectly into smaller spaces. Learn more about what other options are available to you below. 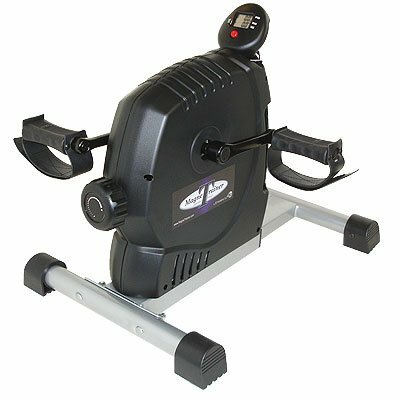 Sunny Health’s SF-RW5515 model is a small sized rowing machine that comes with foldable features for easy storage. 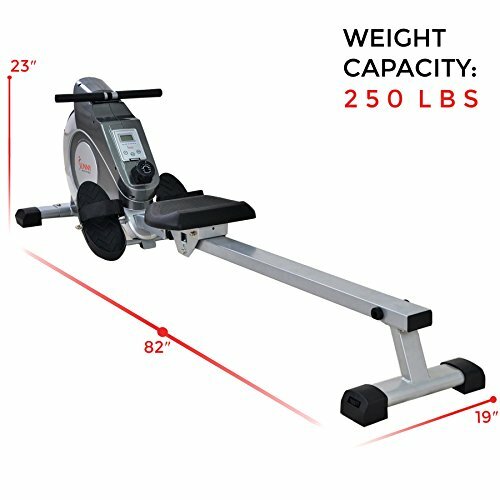 As far as compact rowing machines go, this one’s a great choice. Not only does it come with excellent workout features, it’s also within the affordable budget range too. 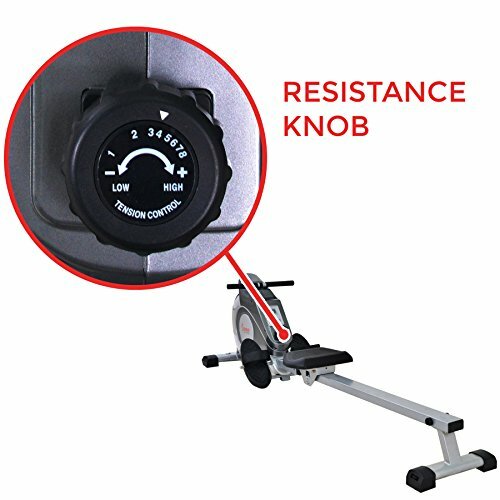 This rowing machine uses magnetic systems to operate the resistance while working out. It involves a magnet within the flywheel that adds resistance towards the metal drum that spins as you row. There are eight total resistance settings to choose from. These can be adjusted easily by using a knob in the middle of the panel in front of you. Each level gets progressively more challenging the higher you go. Number one being the easiest option for beginners and people looking to warm up. Number eight is the hardest that proves to be a challenge for all athletes. Once you’re done working out, simply unscrew a pin and bolt and fold the machine up. Put both pieces back once folded to keep it in place, and it’s as easy as that. You can fold this machine up and store it in a cupboard so it’s out of the way. Furthermore, there are wheels on the bottom which makes transportation between different rooms easier than ever. Heavy-duty steel has been used to construct the frame of this rowing machine. Customers have been saying it feels extremely durable to use. People were surprised by how sturdy yet affordable Sunny Health’s SF-RW5515 model is. Magnetic rowing machines are typically quieter than the more conventional air, hydraulic, and water powered ones. However, various customers have found this one creates more noise disturbance than they were expecting. If you want to lose weight comfortably, the Exerpeutic 525XLR bike may be what you’re after. Not to mention, it also comes equipped with incredible folding features for more space. We liked how there’s a back rest and seat cushions that are comfortable for people of all weights and sizes. You can adjust the seat between heights of 5’.2”-6’.5”. This seat can also take an impressive maximum capacity of 400 lbs. You get to choose between eight different levels of tension. Each level is controlled by a magnetic system so that you can select the easiest levels from umber one, all the way to the hardest, at number eight. The pedalling movement is superbly smooth. This is thanks to the cranking feature that has a high torque capacity. 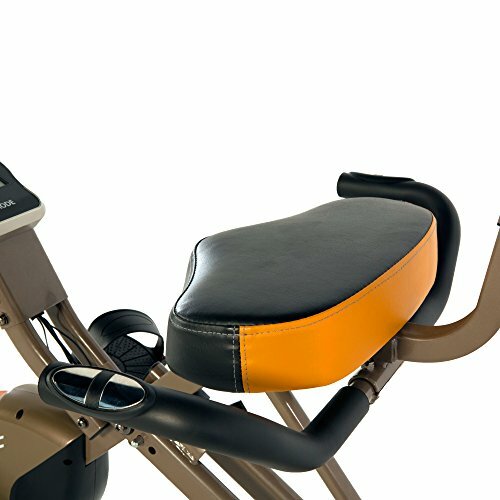 Furthermore, you can use the dual transmission flywheels to add even more resistance and difficulty to your workouts. You can also see your distance travelled, calories burned, and hear rate by looking at the LCD display. You’ll be glad to hear that this bike can fold up to nearly half of its original size. While folded, it’s 27”x18”x48” in size. This makes it perfect for storing away in closets after you’ve worked out. Also, transporting it to a different room is effortless. The wheels on the bottom of the bike mean you can roll it to a different area with no hassle. Some customers have experienced their 525XLR Folding Bike breaking early on. However, once they’ve contacted customer services about their issue, they have received responses. Other people also found this bike to be a pain to assemble. In particular, the electrical cables needed for the LCD computer display are difficult to connect. 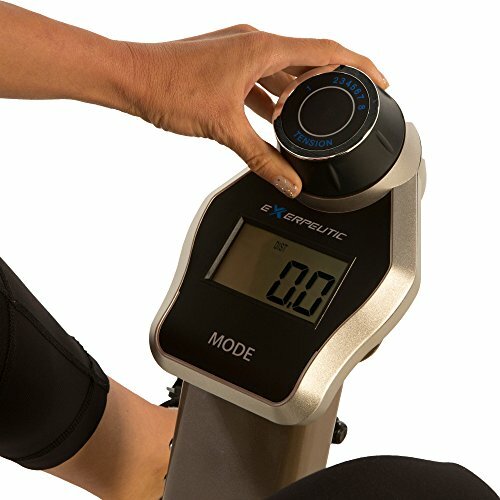 This MagneTrainer-ER Mini Exercise Bike is small, lightweight, and strong. It also lets you use both your feet and hands to exercise. 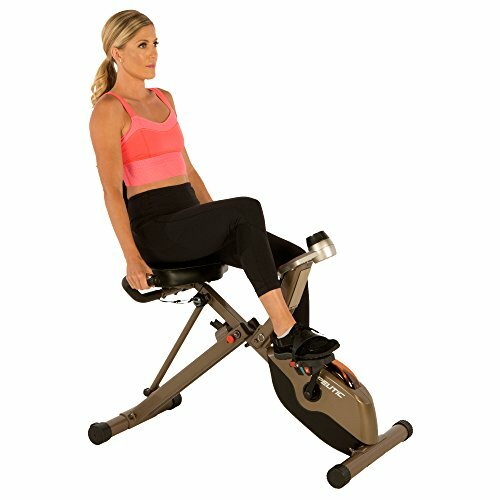 Due to how small and lightweight this mini exercise bike is, you can use it all over your home. You can simply pick it up and use it in your home, or even take it to your office and use it under the desk. It takes up very little space and can just be stored under desks or in cupboards when not in use. There’s a flywheel built-in that ensures pedalling remains as smooth as possible, regardless of which resistance level you choose. You are not limited to a finite number of resistance levels. Instead, you can accurately pick the exact resistance you want by using the 5-rotation dial. You can use it under your desk or simply on the floor while sitting on the sofa at home. 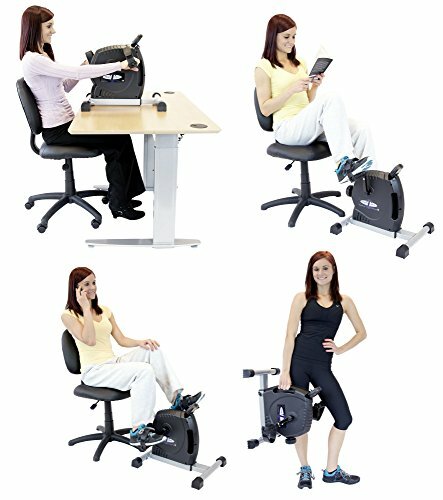 Alternatively, you could even put it up on a desk and use your hands and arms to pedal. This is an excellent variation that helps to keep your workouts fresh and new. A small LCD display lets you track the distance, time, calories, and speed from each workout. This little screen turns on by itself when you turn the bike on and turns itself off when you’re finished. So, it’s super simple to use. 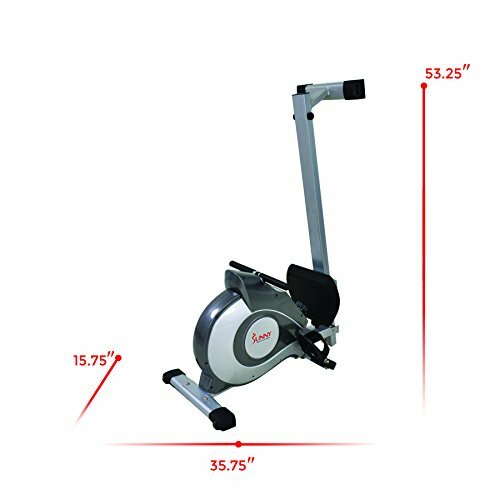 Since you can easily take the MagneTrainer-Er Mini Exercise Bike anywhere, you may be wondering if it’s suitable for work. This exercise bike is small, so using it under the desk while working is not a problem – we found it to be extremely quiet too. Therefore, you won’t disturb anyone around you. Unfortunately, using the MagneTrainer-ER Bike on hard floor surfaces could be problematic. People notice that it doesn’t stay in place as well on harder surfaces. Therefore, the workouts get disturbed as you keep having to readjust the bike. We advise going with one of the more stable options mentioned above if you have harder surfaces. 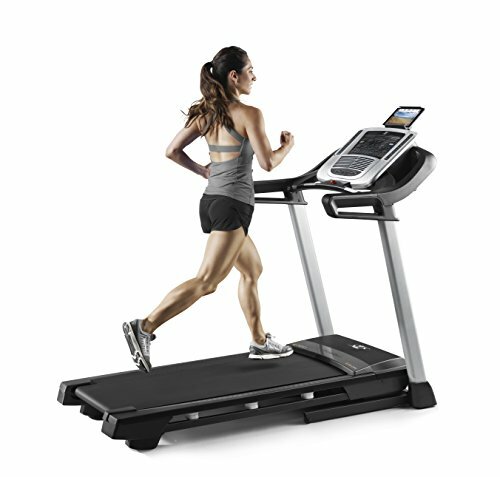 The NordicTrack C700 Treadmill is our top pick, however, that doesn’t necessarily mean it’s best for you. 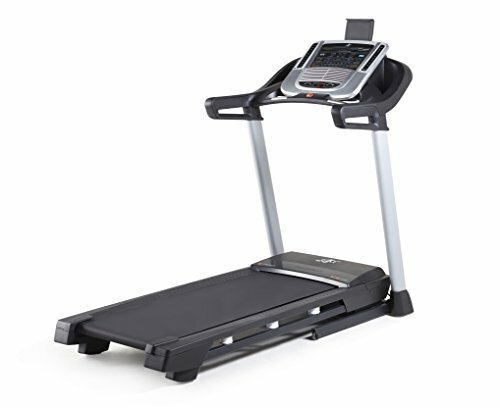 It is on the more expensive side, but you do get a high-quality treadmill that lets you use a ton of advanced workout features to enhance your experience. You can also fold it away with minimal effort and clear space. Having said that, the other three exercise options we discussed are still fantastic choices. Hopefully, we’ve armed you with all the information you need to make the best decision for your needs. Since starting the gym around at around 15-years old, my passion for health and fitness has evolved far more than I ever thought it would. My love for fitness is what made me want to start writing about it. And so, here I am. Not only is my internal fire for this lifestyle burning more than ever, so is my need to help others navigate through their own fitness journeys.